Imagine your job is to analyze the data coming from Fermilab's MicroBooNE experiment. It wouldn't be an easy task. MicroBooNE has been designed specifically to follow up on the MiniBooNE experiment, which may have seen hints of a fourth type of neutrino, one that does not interact with matter in the same way as the three types we know about. The big clue to the possible existence of these particles is low-energy electrons. But that experiment could not adequately separate the production of electrons from the production of photons, which would not indicate a new particle. MicroBooNE's detector, an 89-ton active volume liquid-argon time projection chamber, will be able to. To take advantage of this, every neutrino interaction in the chamber will have to be examined to determine if it created an electron or a photon. And there will be a lot of interactions to study — the MicroBooNE collaboration expects to see activity in their detector once every 20 seconds, including nearly 150 neutrino interactions each day. If all goes to plan, human operators won't have to worry about any of that. When MicroBooNE switches on next summer, it will sport one of the most sophisticated 3-D reconstruction software programs ever designed for a neutrino experiment. According to Wesley Ketchum and Tingjun Yang, two postdocs leading the software development team at Fermilab, MicroBooNE's computers will be able to accurately reconstruct neutrino interactions and automatically filter the ones that create electrons. The key to accomplishing this lies in the design of the time projection chamber. The MicroBooNE detector — the largest time projection chamber in the United States — will be filled with heavy liquid argon and placed in the path of the Booster's neutrino beam. When neutrinos interact with the argon, they create charged particles that ionize the argon atoms. A high-voltage electric field will draw those ionization electrons toward three planes of wires, spaced three millimeters apart. As they pass through, each plane of wires will take a snapshot of the electrons. Taken together, the snapshots will form a full picture of the original particles. 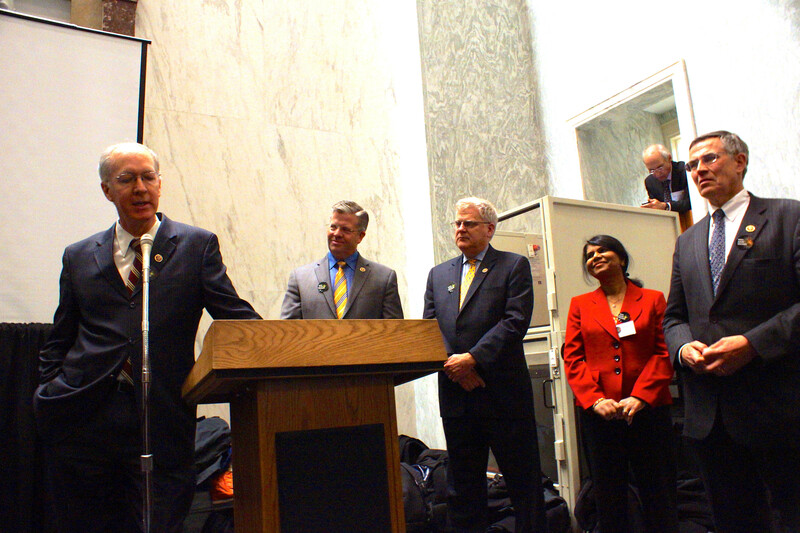 "Three planes of wires at different angles will provide a picture of the neutrino interaction in 3-D," Ketchum said. "We only need two, but the third helps us get rid of ambiguity." The software should be able to provide clear pictures of the data scientists are interested in studying. "We're focused on creating an automated reconstruction package that won't require people to go through and give input," Ketchum said. "We hope that we will have the raw data, and the software will give us all the particles produced when a neutrino interacts, with no human needed." While Ketchum, Yang and the MicroBooNE team work on perfecting the software, they know that even more eyes are on them. The 3-D reconstruction technology used for MicroBooNE will be a smaller version of that used in the Long-Baseline Neutrino Experiment, Fermilab's flagship project. LBNE will use a much larger liquid-argon TPC and will require automated reconstruction. MicroBooNE's TPC will likely be inserted into the detector this month and driven to the newly built experimental hall early next year. It will begin taking data next summer. "It will run for at least three years and give us a definite answer to the MiniBooNE anomaly," Yang said. 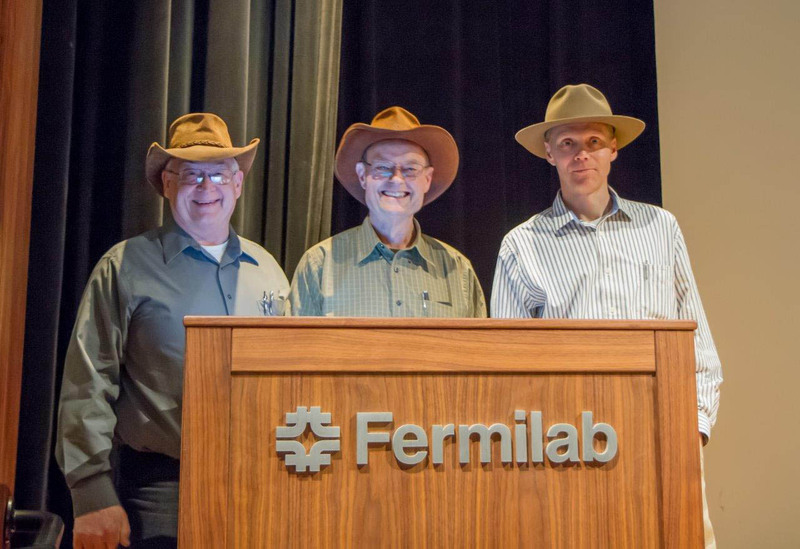 Editor's note: This is the last accelerator update on the restart of the Fermilab accelerator complex following the 16-month-long shutdown. All accelerators are providing beam to experiments and R&D programs, and commissioning of the Recycler is under way. 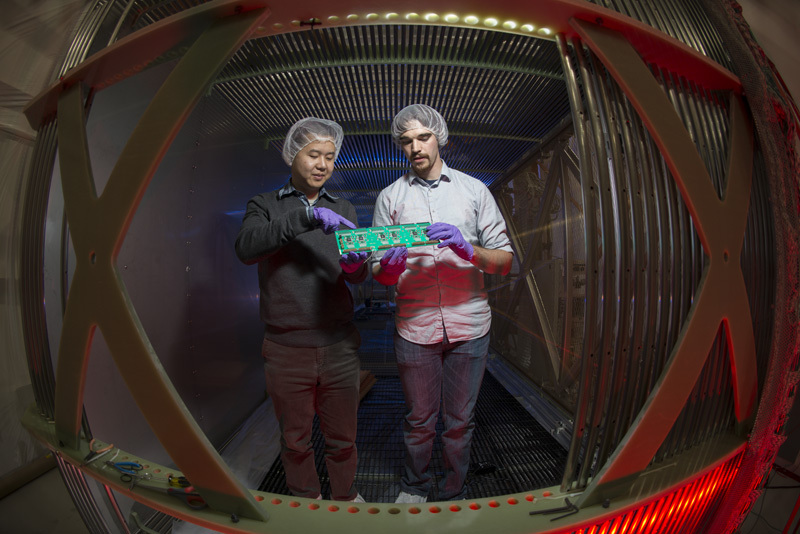 In addition, the photoinjector gun of the Advanced Superconducting Test Accelerator produced its first electrons earlier this year, and the ion source for the PXIE R&D program recently delivered its first beam. Congratulations to all people who contributed to these successes. The Linac and Booster provided beam for the Main Injector and for the Booster Neutrino Beamline. The Main Injector provided beam to the NuMI target for the production of neutrinos for the MINERvA, MINOS and NOvA experiments. The Main Injector also provided beam to fixed-target area experiments. AD personnel worked on the commissioning of the Recycler storage ring. The accelerators provided beam to experiments T-979 and T-1015. Beam was sent to the SeaQuest experiment. 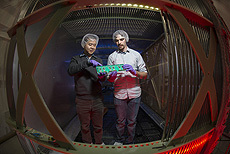 Scientists are close to finishing the commissioning phase of the experiment. The klystron for the RF gun has been upgraded to a 5-MW klystron and is undergoing checkout. Personnel performed coupler and cavity conditioning on Capture Cavity 2 and Cryomodule 2. AD personnel started operating the ion source of the PXIE accelerator R&D program. Beam current is up to 9.1 mA, with an expected 10mA of nominal current. Sergei Nagaitsev, head of the Accelerator Division, wrote this column. Let's be honest: There is no manual on how to run the Accelerator Division. Before I took my new job as the head of AD, I asked many people for guidance. The sagest advice came from outgoing head Roger Dixon: "Life is not about how fast you run or how high you climb, but how well you bounce." During his nearly 11-year tenure as AD head, Roger led the division through many bounces, and the division always came out riding high. For example, our Tevatron collider program ended in September 2011, and we didn't know how fast we could switch gears. Six months later, Fermilab's accelerator complex had already sent muons through the former antiproton source and delivered 350 kW of beam power to produce the most intense high-energy beam of neutrinos in the world. The latest example is the startup of our accelerator complex this summer after a 16-month shutdown, during which we made significant changes to all of our accelerators. At the start of the shutdown, we faced a huge list of challenging tasks to be completed. The goal was to lay the groundwork for increasing the proton beam intensity that we deliver to maximize the scientific reach of our particle physics experiments. With the support from other divisions, centers and sections, our personnel performed an outstanding job and got the work done. Then the startup demonstrated how high we can bounce — the key ingredient to success in our complex environment. In August, acceleration of protons to 120 GeV succeeded at the first attempt — a real accomplishment after all of the upgrades that were made — and in September the Main Injector was already delivering 250 kW of proton beam power. We still have lots of work to do. The goal is to reach 550 kW by the end of fiscal year 2014 and 700 kW in the next couple of years. I tip my hat to Roger for his excellent judgment and for his leadership. Roger has agreed to stay on as my advisor as he starts to pursue his research interests. For those who are trying to entice Roger to work on their projects, my advice is to remember the Old West saying: "The best way to get a cowboy to do something is to suggest he is too old for it." Get your Fermilab gear and science toys today and tomorrow at the Education Office holiday sale outside One West. 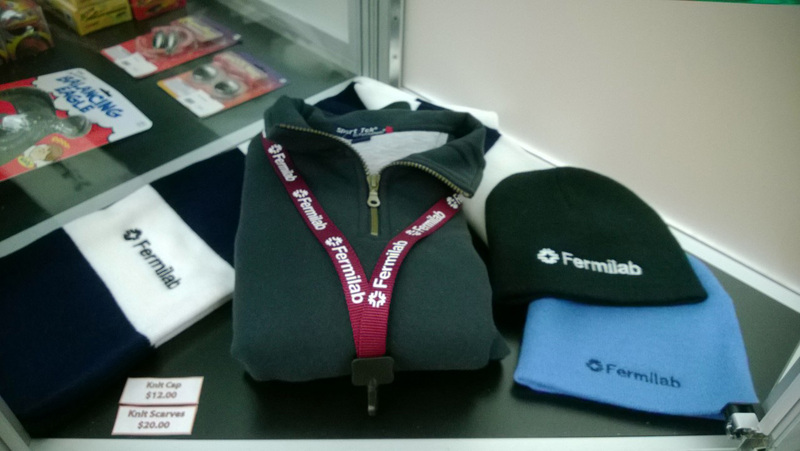 Prepare for the winter holidays with Fermilab gear. From 11 a.m. to 2 p.m. today and tomorrow, stock up on winter clothing, science toys and more at the Education Office's Super Science Stocking Stuffer Sale. The sale will take place next to One West. Most major credit cards are accepted. This week's safety report, compiled by the Fermilab ESH&Q Section, contains three incidents. A contract employee stepped on a piece of metal, which pierced his foot through his rubber-soled shoes. He went to the Medical Office, which recommended he visit his doctor. A contract employee's leg was lacerated by a saw whose guard malfunctioned. He went to the emergency room and received 10 sutures. A contract employee hurt his hand against the sharp edge of a piece of sheet metal while removing it from the CDF detector bore. His hands were covered with leather gloves. He received eight sutures. Give five physicists 10 minutes to talk about their research as if they were a detective, Elvis or Stephen Colbert and you might regret sleeping through high school physics class all those years ago. 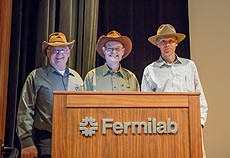 At the second annual Physics Slam last month, five particle physicists at Fermi National Accelerator Laboratory were challenged to explain a complex physics concept to an audience of 850 people of all ages in the most exciting and clear way possible. The participants were chosen by the lab's auditorium committee, which regularly holds events for the public on the lab's campus in Batavia.